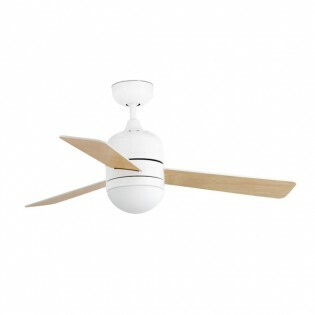 Ceiling fan modern and simple design, Body and blades made of steel finished in white. It has 3 speeds and reverse function. Powered by included wall regulator. Ideal for living rooms, dining rooms or kitchens of a Modern Style and minimalist. Dimensions: High 32 cm. Diameter 120 cm. 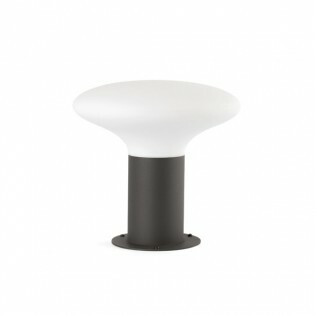 Pedestal Light for outdoor use, BLUB'S. Modern design that diffuses light in a simple and orderly way. Made of grey die-cast aluminium and opal PMMA. Ideal for illuminating chalets, terraces, swimming pool areas, gardens and any outdoor or passageway areas.Water resistant (IP44). Dimensions: High 240 mm. Bottom diameter: 130 mm. Top diameter: 270 mm. LED Lamp Industrial with spring loaded seat post attachment, flat lampshade and decorative grille. Finished in broken white or aged brown. For single or multiple compositions. Made of steel with opal pvc diffuser. 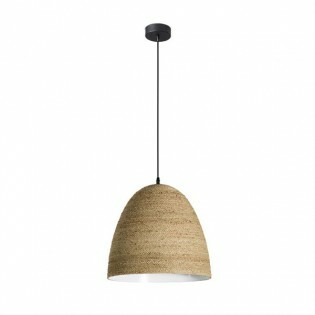 Lounges, kitchens, bars, restaurants, etc.Dimensions: Lampshade Height 14 cm . Diameter 36.5 cm. (Total Height from 34.5 to 64.5 cm). Modern Pendant Light, of 3 original conical-shaped textile shades in white. Innovative system to hold the light sideways at half height of the lampshade. Chrome finish structure. 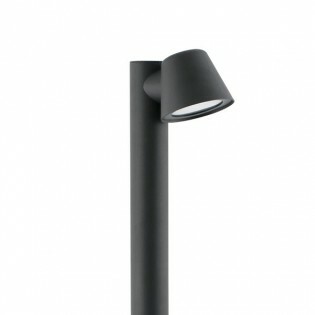 Ideal for use as an additional light source in bedrooms, hallways, living rooms and reception areas. Dimensions: High Max. 178 cm. Diameter 54 cm. High lampshade: 23 cm. 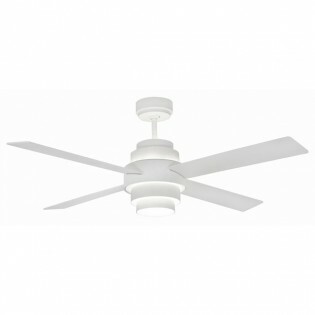 Ceiling fan with light of an average size. Designed in a contemporany style, white steel body with 3 reversible ABS blades in white-arce, opal glass diffuser. 3-speed motor and remote control included. It has an inverse operation mode. 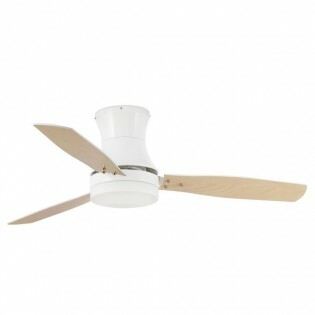 Perfect for living rooms or dining rooms from 13 to 17 meters squared. Dimensions: High 30 cm. Width 106 cm. 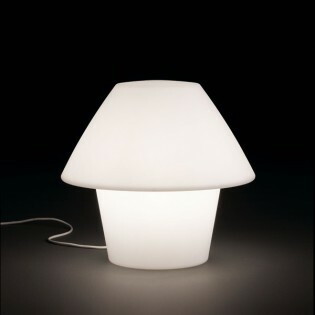 Versus it is a Table lamp for outdoor use, with a certain chill-out air. Made of white polyethylene of medium density. Perfect for terraces, restaurants or outdoor environments of a Modern Style. Water resistant (IP44). Dimensions: High 48 cm. Diameter base 24 cm. Upper diameter 50 cm. 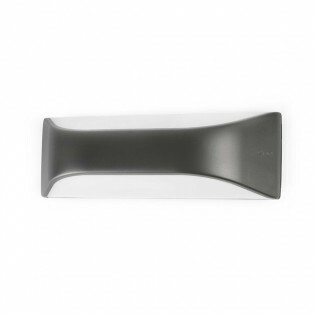 Wall light for outdoor use, modern, with futuristic shapes and bi-directional light (it is diffused from the top and bottom of the wall light). Made of polycarbonate + ABS. 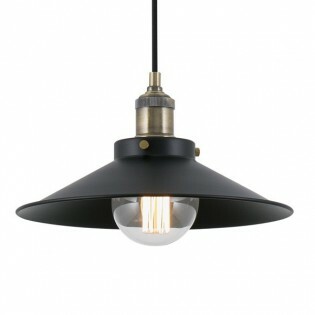 Perfect for lighting terraces, gardens, porches or balconies as well as in any outdoor room. High Weather Resistance. Dimensions: High: 10 cm. Width: 29 cm Depth: 8.5 cm. 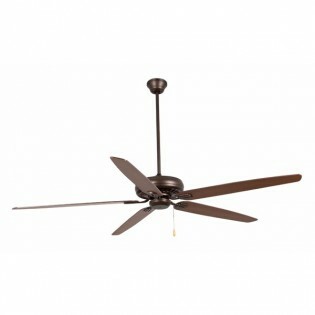 Ceiling fan 4-bladed of big dimensions. 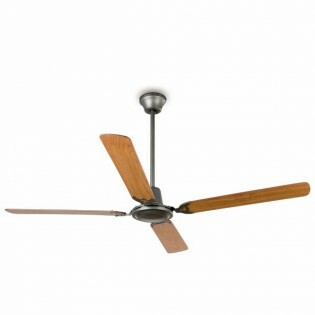 Aged industrial style design with reversible blades in two finishes. Made of die-cast steel and playwood wood. It has reverse function and 5 speeds. Wall control included. Ideal for living rooms, dining rooms or spacious commercial premises due to its large size. Dimensions: High 60 cm. Diameter 140 cm. Transparent Shade Lamp in retro-vintage style. Spherical and flattened shape with a perfect decorative cap for decorative LED bulbs. Dimensions: Height 22.4 cm. Diameter 27 cm. Bollard Light exterior TAU designed by Manel Lluscà, with sober and architectural lines. Bollard Light compact made of die-cast aluminium and opal polycarbonate. Suitable for lighting passageways in outdoor environments such as gardens, common areas, hotels, etc. Water resistant (IP44). Dimensions: Height 64 cm. Width 24 cm. 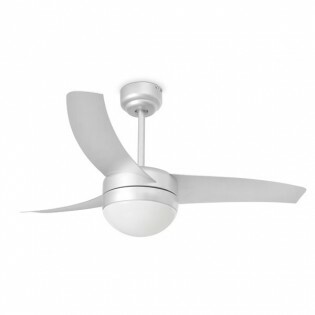 Ceiling fan with light simple, minimalist lines made of grey steel with 3 ABS blades and opal glass diffuser. It has 3 speeds and Remote control included. 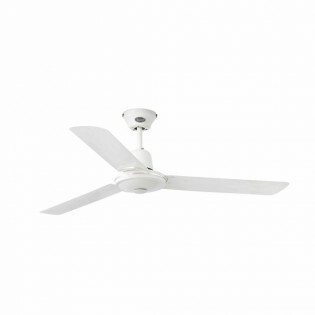 Ideal for living rooms, dining rooms or businesses up to 12 meters squared. Very simple installation. Dimensions: High 46 cm. Diameter 105 cm. 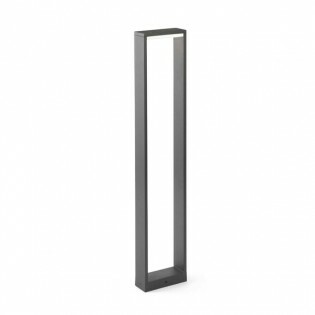 Pedestal Light exterior TAU designed by Manel Lluscà, of sober, architectural lines. Bollard Light compact made of die-cast aluminium and opal polycarbonate, perfect for lighting in outdoor areas such as gardens or passageways. Water resistant (IP44). Dimensions: Height 21,5 cm. Width 24 cm. 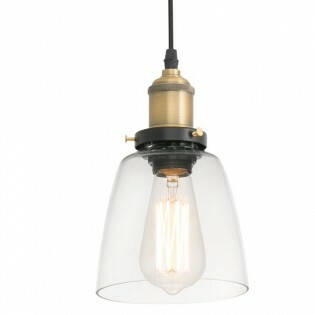 Pendant light Industrial with LED Lighting with ceiling flush light and decorative cable. Flat shade with decorative grid. Finished in broken white or aged brown. For single or multiple compositions. Made of steel with opal pvc diffuser. For trendy lounges, kitchens, bars and restaurants. Dimensions: Height 20 cm . Diameter 36.5 cm. Total Height 170 cm. 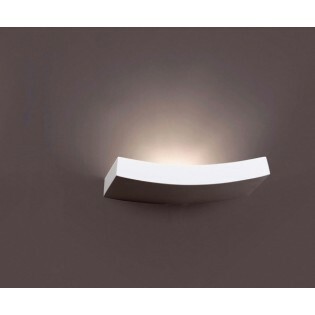 El Wall light Eaco-3 of the Faro brand, is a Designer Modern Wall light made of white plaster. Perfect for installing in bedrooms as a bedside or decorative appliance and in living rooms of a Modern Style to reinforce Ambient lighting. Dimensions: Length 36 cm. Width 16 cm. High: 7.5 cm. The Faro Nuk lamp a fun and original outdoor lamp, perfect for terraces or gardens. 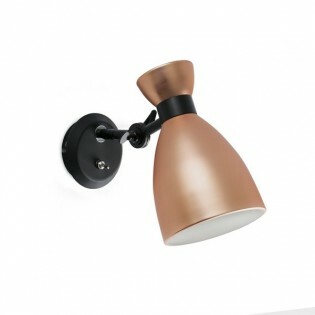 This modern style lamp can be hung or left on the floor. A very decorative, modern chillout style portable lamp. Available in various colours: orange, green, grey or fuchsia. IP44. Dimensions: Diameter 40 cm. High: 41.6 cm. Lovely Wall light WITH 4 lights ball-shaped. LASS is made of a metallic structure finished in chrome and glass. Special for lighting in bathrooms or toilets. Get an original result if you place two sconces, one vertical and one horizontal. Dimensions: Length 44cm. High 9 cm. Depth 12 cm. Lovely Wall light with 5 lights ball-shaped. LASS is made of a metallic structure finished in chrome and glass. Special for lighting in bathrooms or toilets. Get an original result if you place two sconces, one vertical and one horizontal. Dimensions: Length 58 cm. High 9 cm. Depth 12 cm. Ceiling fan of big dimensions for large spaces, traditional design in dark brown aluminium finish and 5 reversible blades in dark cherry-walnut MDF wood. Reverse function. Chain driven. Ideal for living rooms, dining rooms or kitchens of a Modern Style or classic. Dimensions: High 86cm. Diameter 178 cm. 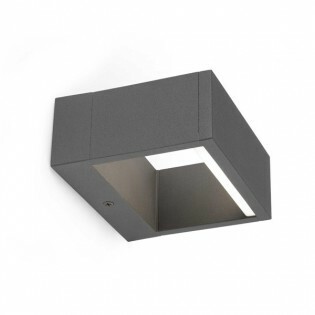 Outdoor Wall Light ALP with very stylish lines and modern design. Made of dark grey finished metal and opal polycarbonate. Lighting with 6W LED technology (warm light). The light is projected from both the top and bottom of the wall light. Perfect for lighting porches, terraces and gardens. Dimensions: Height 6 cm. Width 15 cm. Bollard Light for outdoor use, of modern design (IP44). 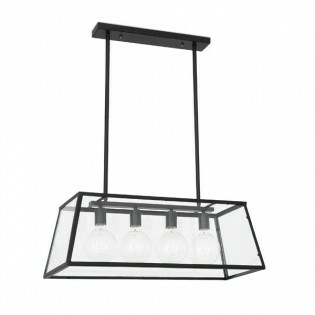 Made of die-cast aluminium finished in dark grey and transparent glass diffuser. Perfect for lighting passageways in outdoor areas, gardens, hallways, terraces or porches. It projects light directly onto the floor thanks to its spotlight design. Dimensions: Height 70 cm. Width 18 cm. Faro Group, established in Barcelona, Spain, is a team of people with international and highly professional profiles. The company offers comprehensive and global “package deal” through all our business lines. It has more than 3000 lighting & fan solutions, operates in more than 90 countries, more than 5000 customers expressed their trust, 45% of export index, and all this during more than 60 years of experience. Faro's designers propose lighting solutions that embrace all styles, offering in their product range pieces suitable for all budgets and decorative lines. Thanks to the vision of light, its projection and its own concepts of forms, each one of them brings its know-how to present emblematic pieces guidelines for each collection. 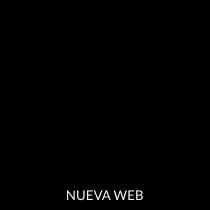 These designers deserve to be mentioned: Estudi Ribaudí, Manel Lluscá, Pepe Llaudet, Nahtrang, Marina Milá, Jordi Llopis and Jordi Busquets. Thanks to them and to the whole team, Faro Barcelona has been "since 2005 the company that releases the most innovations per year" according to Xavier Martín, CEO of Grupo Faro. The wide range offered by Faro Barcelona embraces all the solutions, wall lights, flush lights, desks/table limps, floor lamps, ceiling lights, pendant lights, beacons lights, streetlights, and fans with or without light, in all decorative styles. We can confirm that according to them they provide "solutions to lightening every room in any moment, providing functionality, comfort and aesthetics". The catalogues of Faro Barcelona are currently differentiated in interior, exterior, ventilation and light bulbs.